Q: Do you know how many sworn personnel serve in the Los Angeles Fire Department? Without Googling it! Forgive us if we sound like a broken record, but we really can’t stress this enough: When you’re out on the road, please drive safely. We’ve seen first hand what happens when tragedy happens, as was the case this past weekend. On Saturday afternoon, firefighters from Silver Lake’s Fire Station 35 rushed to 1400 N. Micheltorena St. where a collision left a motorcyclist dead and his passenger critically injured. 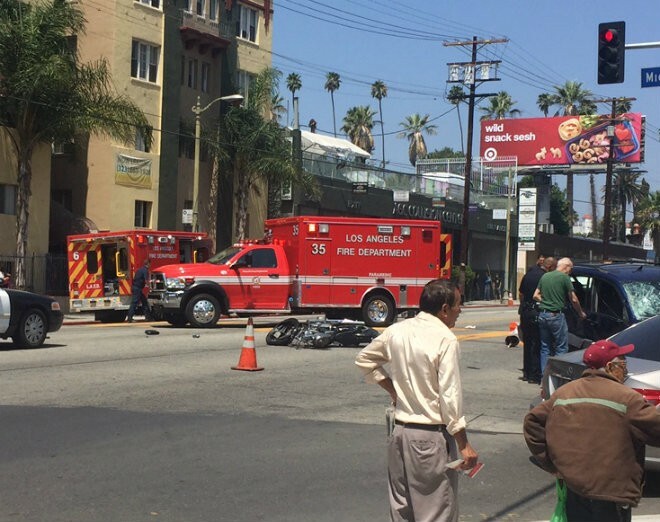 LAFD ambulances and crews on scene of an auto vs motorcycle accident in Silver Lake Saturday afternoon. Photo by Sebastian Cordoba via The Eastsider. On Sunday, you would have understood if firefighters in and around North Hollywood experienced déjà vu. 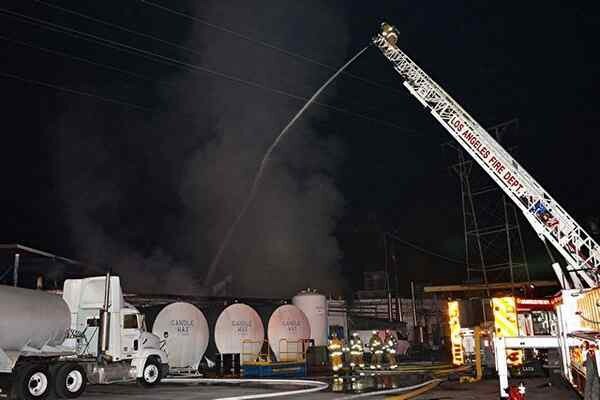 Just 13 hours after extinguishing a fire at the General Wax and Candle Co. on Beck Avenue, crews once again rushed to the building where they snuffed out a stubborn blaze in 42 minutes. 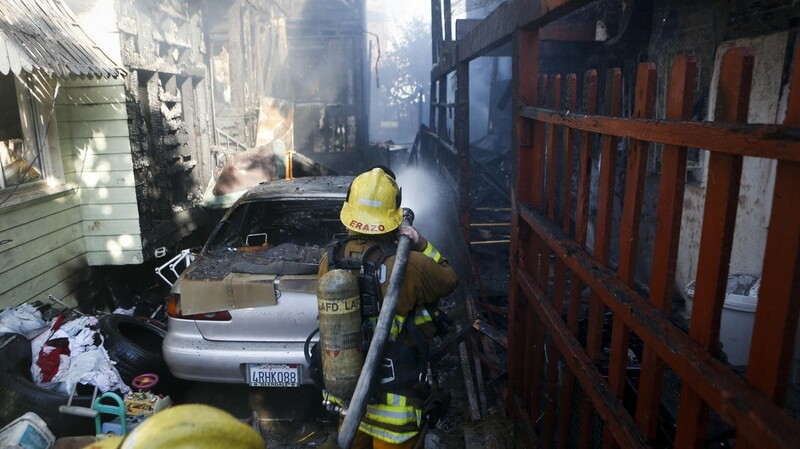 LAFD Arson investigators are currently looking into the cause of both fires. Crews work to extinguish the second fire in 13 hours at the General Wax and Candle Co. early Sunday morning. 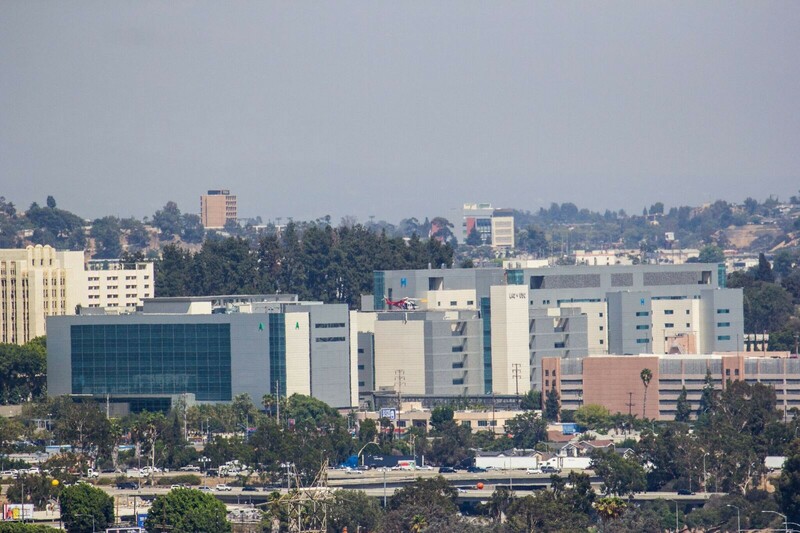 Photo by Rick McClure via Los Angeles Daily News. With a new week underway, it didn’t take long for firefighters to jump into action. 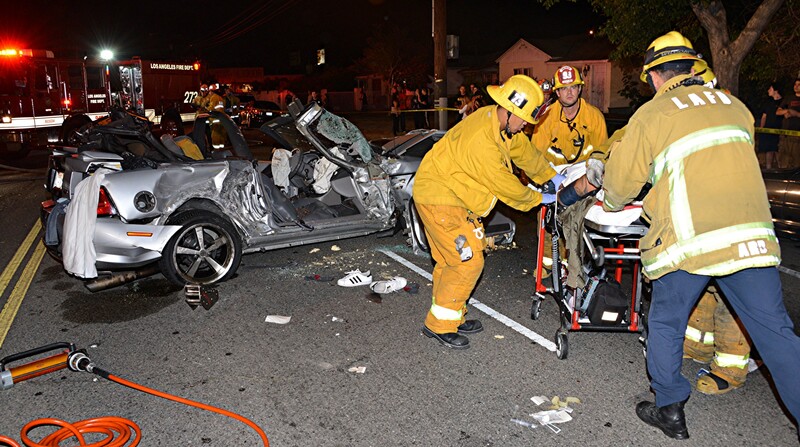 Just after midnight Monday, LAFD crews raced to Vanowen Street near Tampa Avenue in Reseda where they found three men in a convertible coupe critically injured after their car struck several parked cars. 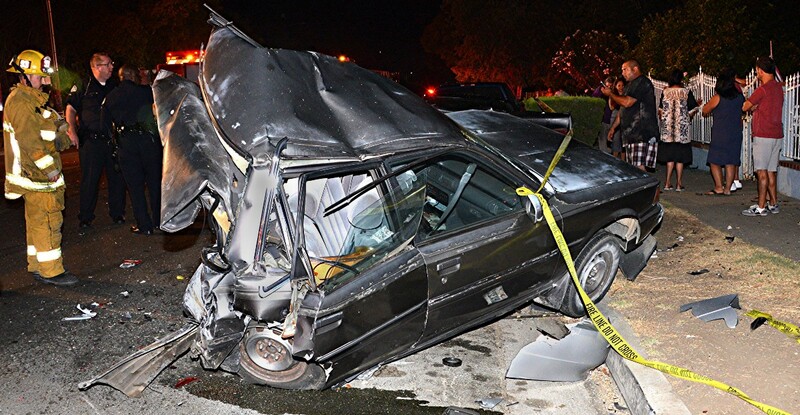 After working quickly to extract one trapped passenger, crews immediately rushed to the aid of the driver and another passenger who were ejected from the car located some feet away. All three men were immediately transported to a local hospital. 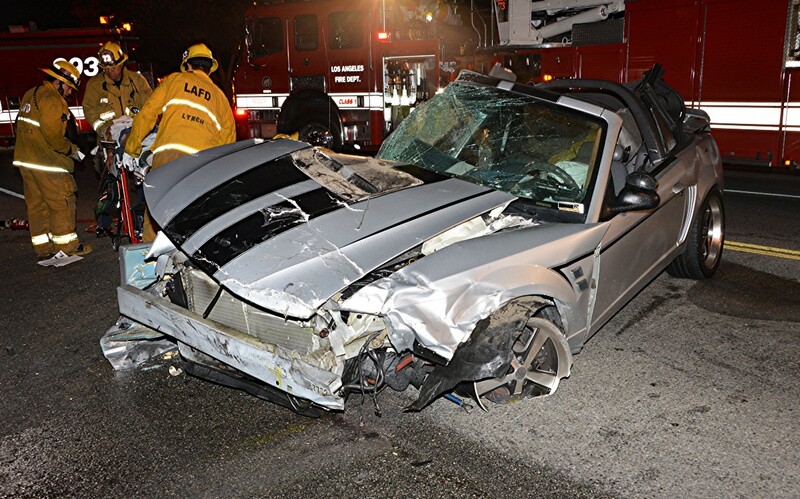 LAFD crews work around the scene of a convertible coupe that struck several parked cars, critically injuring three. Photos by Rick McClure. Just a few hours later in another part of the Valley, 42 firefighters responded to a single-story abandoned home on fire in Panorama City, dousing flames in just 13 minutes. Some of the 42 firefighters that responded to this Panorama City structure fire work high and low to make sure the fire is out. Photo by Cesar Parvool. Just before 1 a.m., things quickly heated up in South Los Angeles. It was during a routine patrol that two LAPD officers saw smoke rising behind a house in the 800 block of 74th St., stopping to investigate. 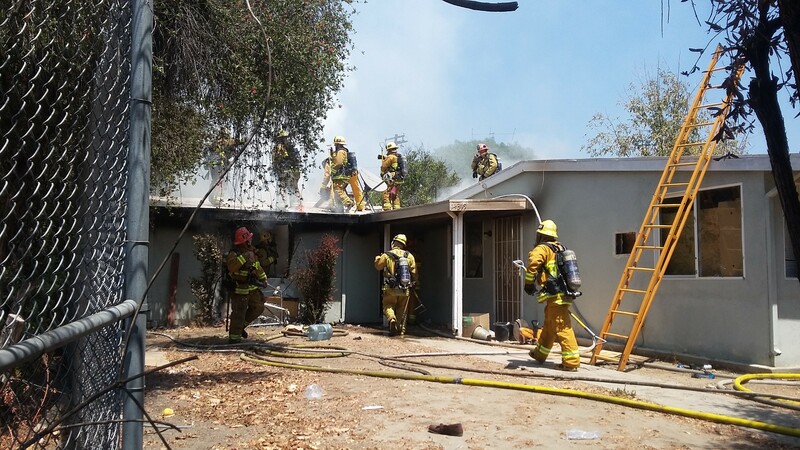 After discovering there was a fire in the home, officers alerted the LAFD and immediately attempted to rescue women trapped inside. Following their arrival, LAFD crews used saws to cut through a number of bars across a side-window to give the trapped women access to escape. As seen in the video below, she would go on to be pulled out and the fire would be quickly extinguished. No other injuries were reported but one dog could not be saved. 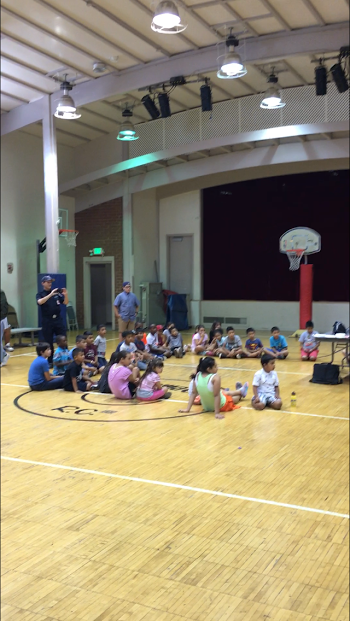 Later that morning, LAFD units partnered with MySafe:LA during a series of visits to summer camps across the San Fernando Valley. These visits not only gave kids a chance to meet the men and women they working in their community but also learn how to be safe in the event of a disaster. 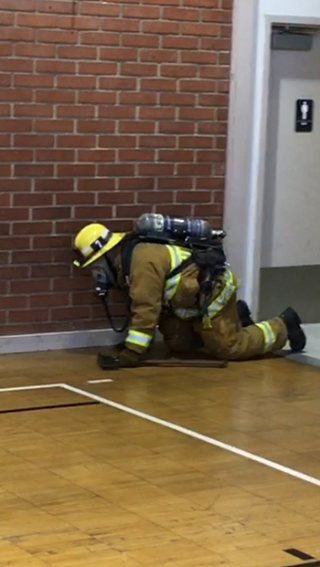 In this scene, kids watch as a firefighter demonstrates how to travel beneath rising smoke and along the nearest wall to find the doorway. Photos via LAFD Valley Facebook. 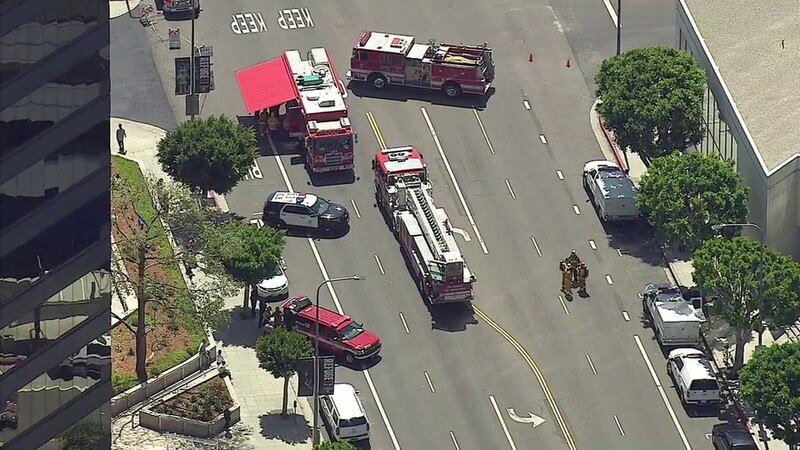 Meanwhile, in Brentwood, a report of a leaking package inside the Wilshire Bundy Plaza prompted scores of LAFD and LAPD resources to respond, ready for a worst-case-scenario. Following the building’s evacuation, crews thoroughly investigated to ensure safety of all workers and drivers, finding that the report fortunately proved erroneous. LAFD and LAPD resources are seen on scene outside the Wilshire Bundy Plaza in Brentwood. Photo by ABC7 via Twitter. We’re just getting started…Wednesday kept firefighters busy as crews battled to save historic homes and respond to 1,369 other incidents. Around 4:45 p.m., Los Angeles Firefighters raced to the 1200 block of S. Bonnie Brae in the Pico-Union neighborhood where three, multi-story homes caught fire. The fire was firmly entrenched in the attics of the two large homes and spread to the third house located on 12th Place. Firefighters began an aggressive interior fire attack with a coordinated roof ventilation operation on all three structures. Despite the steep pitched roof, holes were cut to clear out the hot gases and create a more tenable environment for the crews waging a fierce battle inside. After one hour, firefighters confirmed that all flames were out. A total of 41 people were displaced from their homes and temporarily sheltered at nearby Fire Station 13 to wait for members of the Red Cross to arrive and assist them further. No patients required transportation to the hospital. Three dogs were pulled out of the initial structure with two reunited with their owners. Unfortunately, one was deceased. 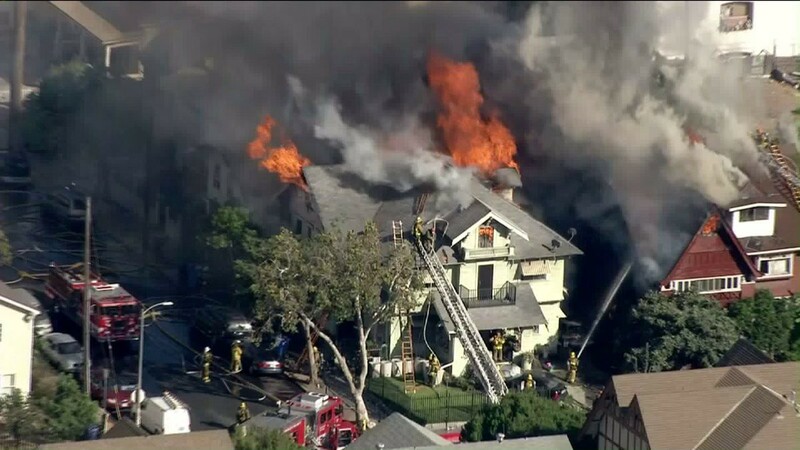 LAFD Public Information Officer (PIO) David Ortiz took viewers into the action as firefighters battled flames inside one of the three homes as seen in this post via @LAFDTalk on Twitter. LEFT: Aerial image shows two of the three structures on fire surrounded by LAFD resources. Photo by KTLA via Twitter. RIGHT: On the ground, firefighters continue their assault on flames ravaging the roof of the corner house. 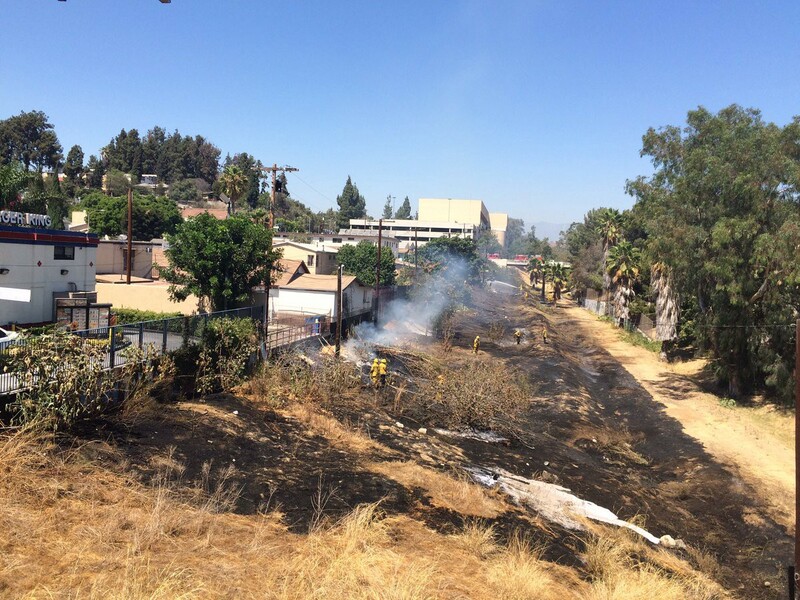 Photo by LAFD PIO David Ortiz via @LAFDtalk Twitter. LEFT: Crews assess the damage to the top floor of one of three structures burned. 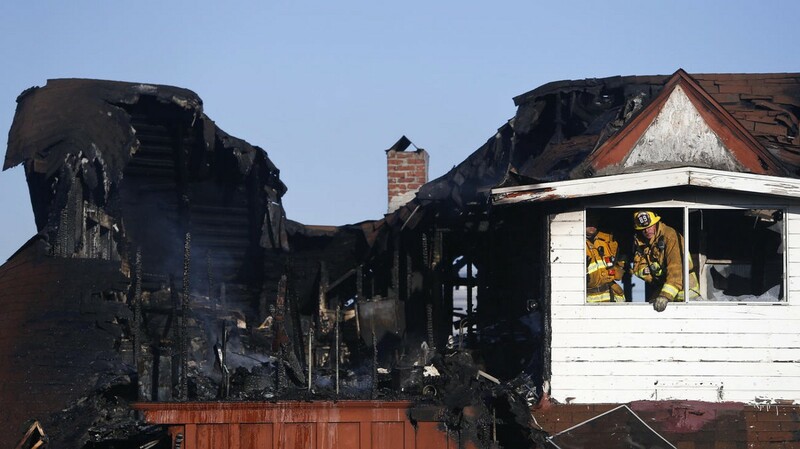 RIGHT: A firefighters continues dousing hot-spots on the ground between homes. Both photos by Harrison Hill via the Los Angeles Times. 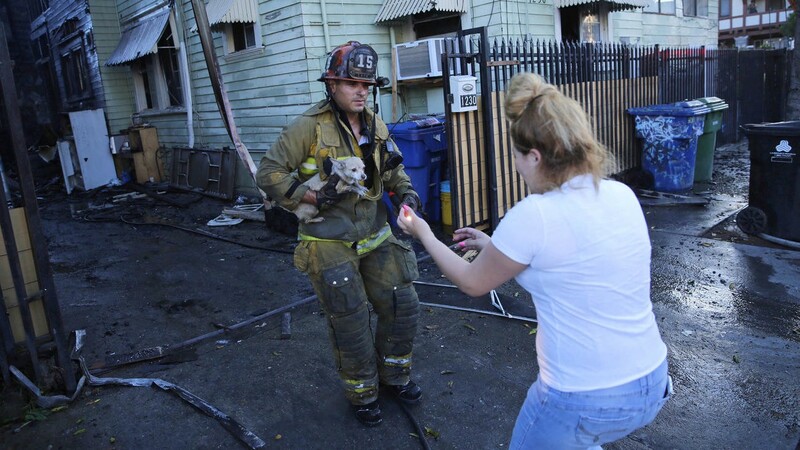 Filled with joy, a resident of one of the burned structures is reunited with her beloved dog that was rescued by firefighters. Photo by Jay L. Clendenin via the Los Angeles Times. Thursday was…interesting. 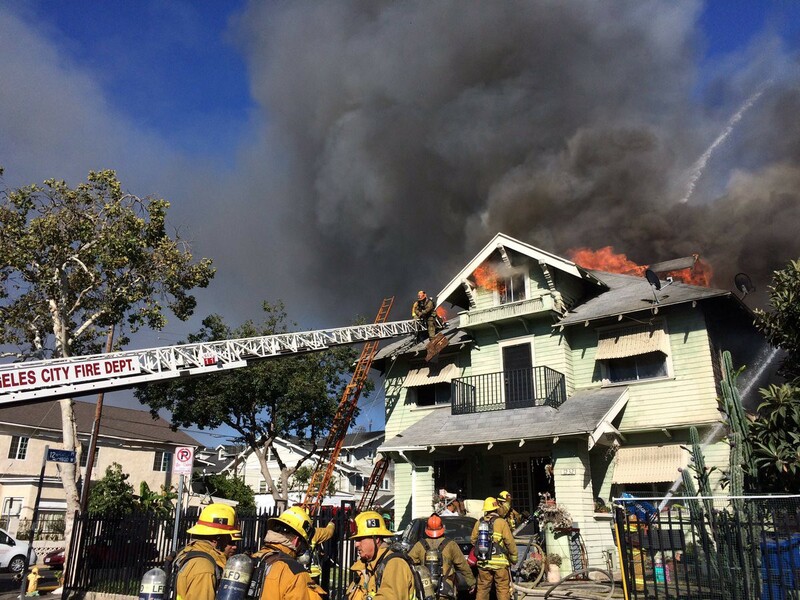 A total of 1,319 incidents kept firefighters busy throughout Los Angeles but two were especially noteworthy. 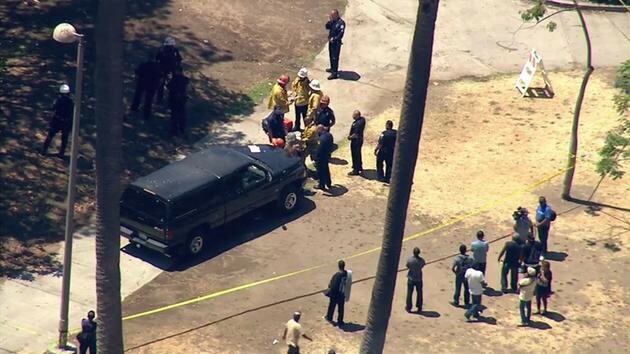 In Westlake around 12:45 p.m., a car jumped the embankment and drove into MacArthur Park, critically injuring four. All four men were immediately treated for their injuries and taken to a local hospital. 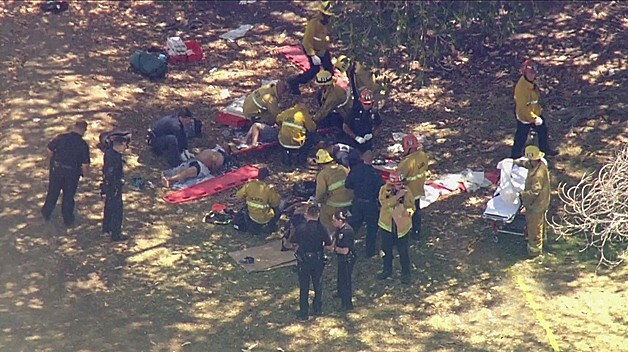 LEFT: LAFD crews assist four injured males that were struck by a pickup truck in MacArthur Park. CBS Photo via Twitter. RIGHT: The pickup truck that hit the four men is seen being investigated by LAPD personnel. Photo by ABC7 via ABC7.com. Then, crews took to the sky to rescue another. 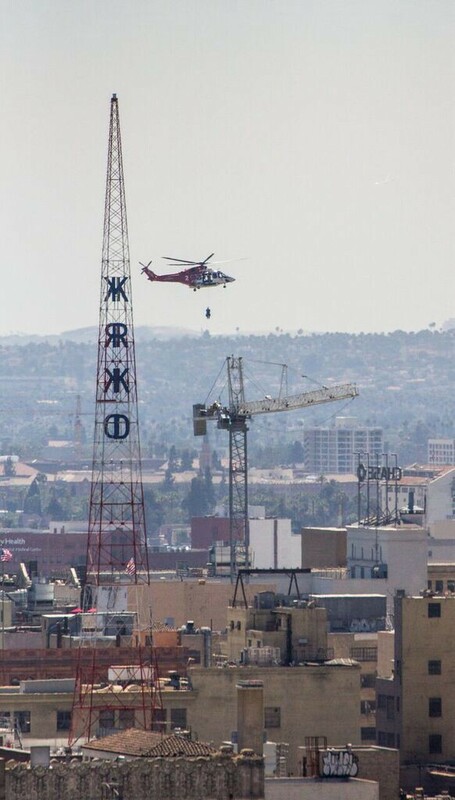 The call came in at 1:28 p.m. A crane operator in distress atop a 270-foot crane in Downtown Los Angeles. After paramedics scaled hundreds of stairs to evaluate the patient, crews decided the safest method to remove him from such a precarious location would be via helicopter. Two LAFD helicopters arrived on scene minutes later with Fire 2 taking the lead on the rescue. 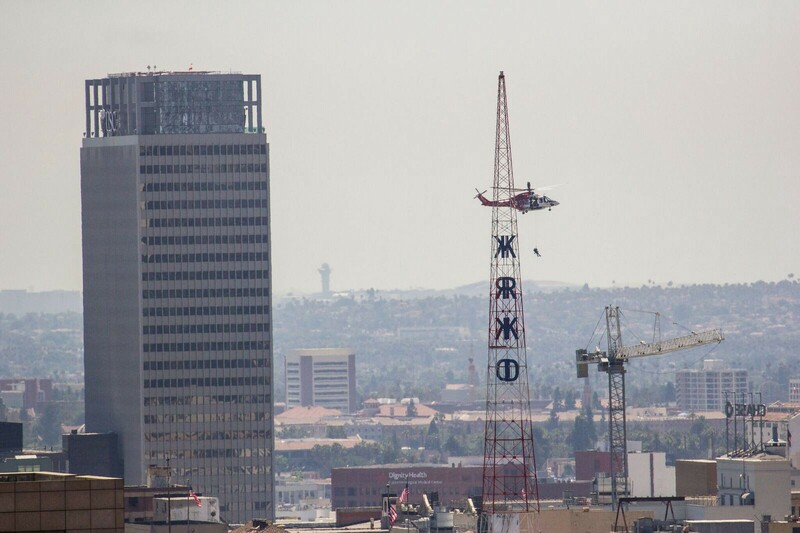 With pilots carefully navigating their chopper through the towering skyscrapers of downtown, Fire 2 lowered a paramedic down to first assess the situation. After securing him in a harness, the patient was safely hoisted up and taken to a local hospital all under five minutes. 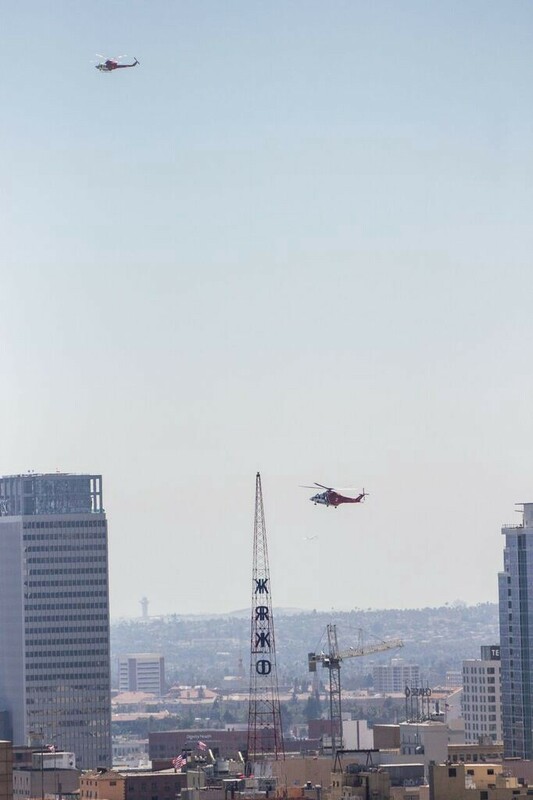 RIGHT: LAFD Air Ops Fire 2 slowly lowers their paramedic toward the back of the 270-tall crane in downtown Los Angeles. RIGHT: After successfully lowering their man, Fire 2 hovers nearby while Fire 1 stands by, ready to assist if needed. LAFD Photos by Alex Gillman. LEFT: With the evaluation complete, Fire 2 hoists the patient off the crane toward their helicopter. RIGHT: Just minutes away, Fire 2 arrives at the USC hospital. LAFD Photos by Alex Gillman. 35 minutes — saving the nearby structures with no injuries reported. Finishing off the last hot spots burning in the thick brush, firefighters have saved at least three nearby structures from this Boyle heights ravine fire. Photo by Dan Curry. A: 3,242 sworn personnel and another 348 of the LAFD serve the almost 4 million people in the City of Los Angeles. How’d you do? The official Medium channel of the #LAFD. For incident alerts follow @LAFD. To report an emergency, call 9-1-1.